I'm not normally a fan of short stories, whether presented on their own, as a tie-in to an existing novel or as a collection around a particular theme. I generally find there simply isn't enough space for the proper plot development and characterisation that usually draws me into a book, and they lack a certain spark which could have made them more than just an unpolished draft of a much-longer story. 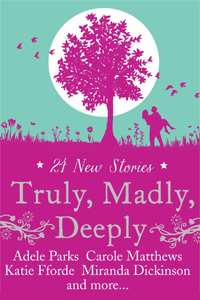 When I initially heard about Truly, Madly, Deeply I figured this wouldn't be one for me. However, some of the authors involved I admire greatly and so despite my normal stand on short stories I found myself tempted by the idea of the novel and eventually decided to give it a go. And I am very glad that I did as this is a surprisingly meaningful collection of contemporary and historical women's fiction. The great variety in authors, settings, characters and even genres within the larger women's fiction umbrella makes this not only a book in which everyone will be able to find that one special story that will make them laugh out loud on the train or tear up vehemently, but also a delightful discovery of new writers and lesser known but still very significant historical affairs. Each story is introduced by a brief summary of the author's life and writing accomplishments, whetting the reader's appetite before they've even read a single word of the story. In my case, while I picked up the novel to read something new from favourites such as Carole Matthews and Miranda Dickinson I ended up falling in love with many other authors too. Particular highlights were Anna Jacobs' A Sensible Proposal, which offers a small glimpse into the lives of people in the mid-19th century who made the extraordinary brave decision to travel to the other side of the world in the hopes of finding better prospects, and Sue Moorcroft's incredibly funny Shocking Behaviour, which made me simultaneously snort out loud and recoil in horror at the thought of 'Rosie' being on the loose. The format of short stories makes Truly, Madly, Deeply ideal to read in short chunks at a time, as each individual segment probably doesn't require more than a twenty minute attention span from its reader. This makes it perfect for people who are usually too busy to tackle a larger book or are unable to keep their focus on the story, as well as those who are in the middle of an intense read and would like something different to take their minds off for a bit. I initially set out to see if this book would make a good Mother's Day gift and while it certainly does, once you've got your hands on the gorgeous cover (which I instantly fell in love with myself) you probably want to keep it for yourself. You have been warned.